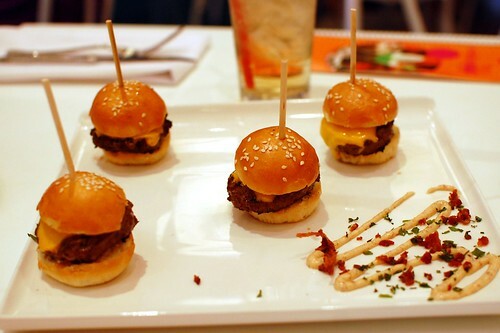 As I mentioned in a previous post, all of our meals at Caesars Palace restaurants were comped this past weekend. 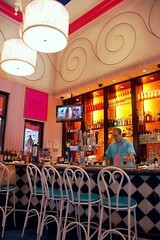 Serendipity 3 at Caesars Palace was a pleasant place for a casual all-American meal. 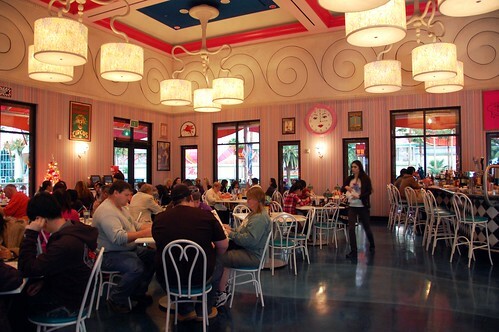 The restaurant is pink and orange and whimsical all over. We had a much better visit at this outpost than we'd had at the original New York City location years ago primarily because of this lovely little placard. When you flash a Seven Stars card, no matter how long the wait is, you get ushered to a seat immediately. It works at buffets. It works at fast food eateries. 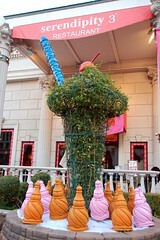 It works at Serendipity 3. We skipped a 30-minute line. Score. Hot chocolate, whipped cream, cinnamon, shaved French chocolate ($5). Warm hug in a mug. 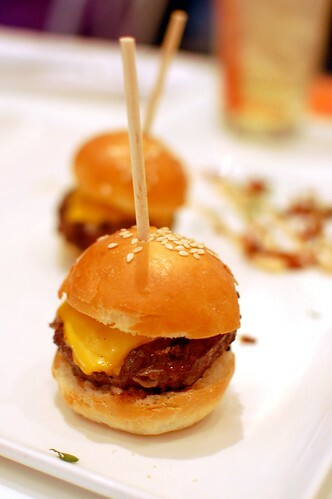 Safe at Home Kobe Sliders -- Kobe beef, melted American cheese, and bacon aioli on home plate mini buns ($12). I don't know if we were really hungry or what, but these were some badass beefy bites. 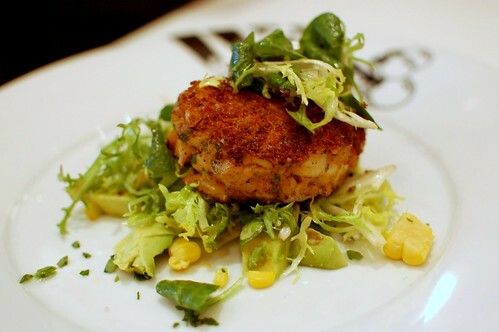 Crab cake salad -- Maryland jumbo lump blue crab cake, ruby red grapefruit, avocado, corn, and red onions topped with mache and frisee salad tossed with herb vinaigrette ($16.50). This was actually just half of the salad because the kitchen was kind enough to split it onto two plates for us. Surprisingly tasty salad at a place known primarily for desserts, burgers, and sandwiches. 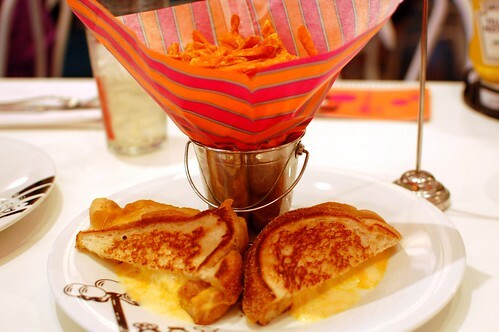 Triple decker grilled cheese -- cheddar, American, Brie, and Swiss served with a cup of tomato soup or fries ($15.50). We got sweet potato fries and a cup of tomato soup because we're greedy like that. The sandwich was a cheese-filled dream, the only imperfection being the additional slice of bread in the middle. Didn't need that. 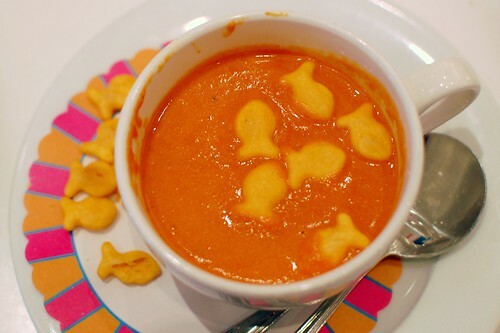 The soup was nice for dipping, although it wasn't so impressive on its own. Strawberry in Right Field Malt ($10.50). I only had a small sip of this, but my husband enjoyed it greatly. Real strawberries. Real ice cream. Real good. Aside from immediate seating, our Seven Stars card yielded the next two complimentary treats. Well, I guess they would've been complimentary if everything wasn't already comped. Even so, we were still stupidly excited. 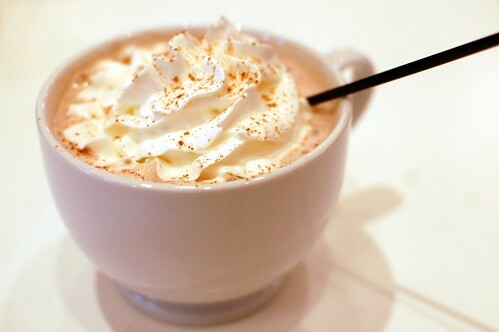 Frrrozen Hot Chocolate for Two ($14). Overrrated. But it was frrree. We liked that. The thought of actually paying $14 for this makes me a little ill, though. A Frrrozen Hot Chocolate mix gift bag. Too much chocolate for me, but we knew right away that we were going to give it to one of our sweetest friends when we went home. We practically said it at the same time. I love that. 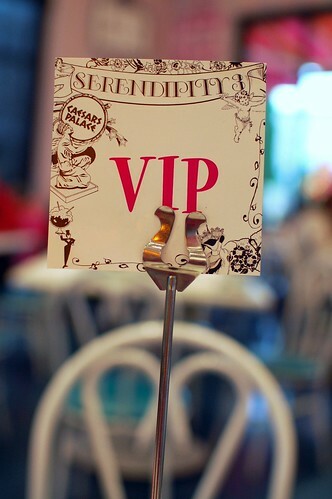 Would I recommend Serendipity 3? We had a grand time because of the special Seven Stars service, but I'm not sure I'd be thrilled waiting for or paying for this meal. The food is familiar and comforting, but nothing about it is extraordinary. I'd definitely redo our Seven Stars experience, though. I wish we qualified for a Seven Stars card of our own. I wish we had a Seven Stars card for life in general. 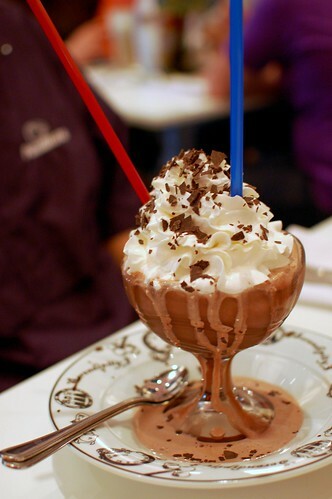 I still remember the frozen hot chocolate I had at the Serendipity in NY fondly. We put our name in and then went wandering around the hood a bit so the wait didn't seem so bad. I definitely wouldn't stand around for hours for one, but it was perfectly satisfying that day. Cute looking restaurant. Hooray for skipping the line. Also thanks for the tidbits on the food. 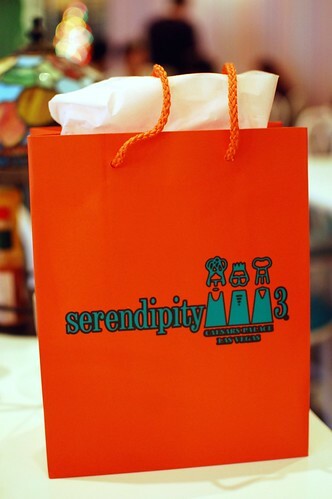 I was at the Serendipity in NY & just had the ($$$$) frozen hot choc. It was alright. Something I got to cross off my list but I didn't understand the fuss. There's a Serendiptity 3?! I waited 4 hours to get in back in 2005... still can't believe it! ditto on needing a seven stars card for life. 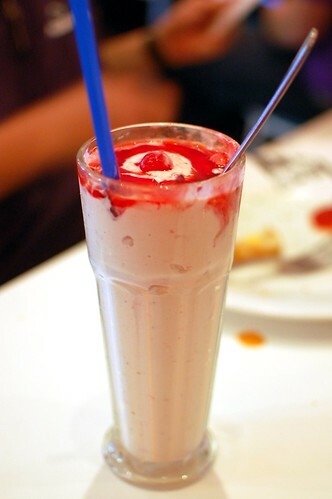 and yeah, the frozen hot chocolate wasn't all that when i went to the og serendipity back in the day. I think you just blogged my perfect meal. ditto re: frozen hot chocolate being a tad bit overrated. but everything tastes better when it's freeeeeeeee! I love chocolate so much that I think the frozen hot chocolate is oodles of wonderful. Free would just make me ecstatic. yea, i was unimpressed with the frozen hot choco, though i would drink it stat if it was free :) i need that card...i need it bad. You are one lucky duck! One of these days, curiosity is going to get the best of me and I'm going to spend $14 on a tall cup of mediocre frozen hot choco. I tried the frozen hot chocolate there this summer and agree - it's overrated.